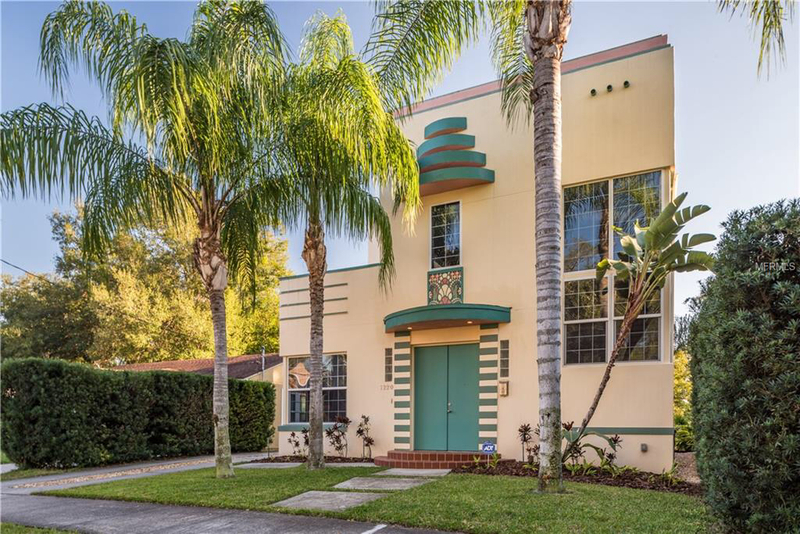 SPONSORED: This three-bedroom, three bath home in Lake Davis/Greenwood is straight out of South Florida and full of Art Deco charm. Located at 1220 Catherine Street [GMap] this 2,451 SF home boasts unique architectural flourishes and was built almost to spec after a 1936 Miami Beach home designed by Henry Hohauser, as interpreted by Dan Tyree of Winter Park. It features two master suites with one on the first floor and the other on the second, along with a bonus room with a balcony that could easily be used as a third bedroom or office. The kitchen is large and features an abundance of storage alongside stainless appliances and Kraftmaid maple cabinetry, and the living room is large and open and ideal for entertaining. Off the kitchen, you’ll find a laundry/mud room that can be closed off from the kitchen using built-in pocket doors. Above the detached three-car garage is a studio apartment with its own address and private parking garage which could be perfect for guests, a private office, or a rental unit that could bring in around $1,000/month of income. The asking price for this special home is $534,000. Click HERE to see the listing or for a tour, contact Lindsey Bailey at 321-594-8160 or [email protected].